This isn’t a lot that is biologically exciting about the EverMild onion from what I can tell. Hopefully there will be more details on Monday when these onions are officially announced on Monday, but the short version seems to be that plant breeders at Seminis have developed a variety of sweet onion that can be grown in the pacific northwest over the winter, supplying sweet onions grown within the US at a time when they normally must be shipped in from the tropics or southern hemisphere. So plant breeding has produced a new hardier variety of sweet onion* and is taking part in the new trend towards “branded” breeds of produce (like the Jazzman rice I talked about earlier this year). This would normally hardly be news (Seminis sells over 3500 kinds of seeds and they’re adding one more), and if it was at all, would be a story of reducing the demand for imported food with new varieties adapted to the US (again there are parallels to the Jazzman rice story). But I expect we will be hearing a fair bit about the EverMild onion at some point, because Seminis was bought by Monsanto several years ago, and I’ve alreadying read comments from people convinced it is a “secret GMO.” Nevermind that sweet onions (onions breeds that are lower in sulpher) have been around for a century. Coverage of the branded onion in the St. Louis Post-Dispatch, though unfortunately the coverage seems written by and for MBAs and marketing majors not biologists. If you see any coverage that actually gets at the breeding behind this onion, please let me know. Random onion fact: Onions (and Garlic) are actually monocots, more closely related to pineapples and bananas (and yes, corn) than to most of the vegetables in the produce section. 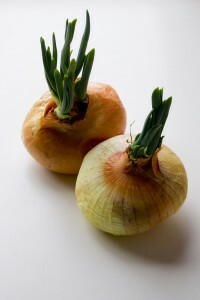 *Or bred a hardier variety of onion to be less pungent, or introgressed traits from one into the other. These are the questions I wish I knew the answers too, and it’d be fascinating to talk to one of the onion breeders who worked on this project. Plus I could ask them if Seminis still practices what I’ve been told is the traditional pairing of onion and carrot breeding at vegetable seed companies, which is entirely unrelated to the EverMild Onion, but I’m just curious. I doubt we’ll ever hear much about the actual breeding of this — seed companies don’t tend to be all that eager to let other companies know how to develop a competing variety. I fear you’re probably right Joseph. It’s a shame, in of the advantages of patenting plant breeds (I’m assuming that’s true in this case) is that companies don’t have to be quite as careful about trade secrets. Growing onions (or anything) in the winter also increases water-use efficiency, just because humidity is higher. Not that onions are a huge water user…. Based on recent posts, I see I should be reading your blog. But I’d better finish my book first. I hadn’t made the connection, but I completely agree, winter grown onions should use less water per pound of onions produced. I’m glad you enjoy the site and best of luck finishing up the book.